Cholesterol is a waxy yellowish substance present in your blood that the body needs to build and maintain cellular health. Our body also does need cholesterol to make hormones and substances that help digest foods. The main function of cholesterol is transportation of fats. It also plays several other roles such as converting sunshine to vitamin D and protects red blood cells and also serves as defense mechanism. Low-density lipoprotein (LDL) - this is the "bad" cholesterol that can cling to arterial walls and create blockages that result in strokes and heart attacks. High-density lipoprotein (HDL) - this is the good type that is going to actually protect you from heart disease. Some of the most common causes of high levels of cholesterol in the body are family history of heart disease, obesity, high blood pressure, intake of excess of fats in the diet, lack of exercise, stress, excessive drinking and smoking, diabetes and stress. High cholesterol has no symptoms. A blood test is the only way to detect high cholesterol. Mostly, a test called lipoprotein profile is used to test the cholesterol levels in terms of total cholesterol (the sum of HDL, LDL and VLDL), HDL, LDL and triglycerides. Usually, blood cholesterol levels should remain below 200 mg/dL (milligrams per deciliter of blood). 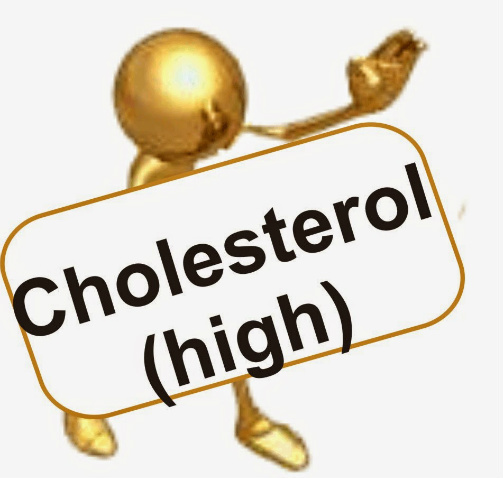 It is considered borderline high when it is between 200 and 239 mg/dL, and when it increases to 240 or higher mg/dL it is regarded as high cholesterol. High cholesterol can cause atherosclerosis, a dangerous accumulation of cholesterol and other deposits on the walls of your arteries. These deposits (plaques) can reduce blood flow through your arteries, which can cause complications, such as: chest pain known as Angina, Heart attack and Stroke. If you are also gasped with cholesterol then there is no need to worry as there are many natural home remedies that reduce the level of cholesterol in the blood. Make a fine powder each of 25 gm Fennel seeds, Almonds and dried Rose petals and save in a vessel. Take 1 tsp along with water twice a day. It is the most effective and natural way to reduce high cholesterol without any side effects. Eat one Walnut daily on an empty stomach then consume 3 drops of Nigella seeds oil during breakfast. Mix I tsp Psyllium husk in a glass of lukewarm water and take it before sleep. Do it for one month continually your high cholesterol will be normal. This is a 99% trial and natural treatment to lower high cholesterol. Make a fine powder each of 25 gm Nigella seeds, Worm Wood/Southern Wood (Afsanteen) Indian Rhubarb/ Rhubarb root (Rewandchini/Rewand khatai), Crystallized salt petre (Kalmi Shora) and 50 gm Cumin seeds (Zeera) and save in a vessel. Take 2 gm after every 3 hours along with water. This is a highly beneficial and trial prescription for high cholesterol. Boil 30 leaves of Australian Fever tree / Eucalyptol (Safeda)in 8 glasses of water until reduced by 3 glasses let it cool and after filtering it save in a glass bottle. Make lukewarm ½ glass of this decoction and give it to the patient to drink 4-5 times a day. It is a natural & magical tip to cure high cholesterol completely. Soak one table spoon Basil seeds (Tukh Malanga) in a glass of fresh water overnight next morning add any syrup of your choice and drink it. Basil seeds are one of the best home remedies that help to reduce the levels of cholesterol in the body. It disintegrates cholesterol from the arteries and washes it from the body. Boil a cup of water with a pinch of cardamom and a pinch of cinnamon for five minutes then add a cup of whole, organic boiled milk and sip slowly when it is lukewarm. Cinnamon is very effective in reducing blood sugar and high cholesterol. This is a highly beneficial and trial treatise for high cholesterol. Take 1 gm Liquorice powder on an empty stomach and 1 gm in evening along with water. It will be quite beneficial for controlling high cholesterol. Daily consuming one teaspoonful of Sweet Almond Oil is proven to reduce cholesterol. Make juice of 1 Beetroot, 2-3 Carrots, 1 Apple, ½ inch Ginger, 1tsp Black pepper powder, Salt 1 pinch add water if needed. Stir well black pepper powder and salt on it. This natural remedy is highly effective for treating high cholesterol. Pour 150 ml of boiling water over 1 to 2 grain coarsely powdered rhubarb root and 1-2 green Cardamoms pods and then strain after 5 minutes. Add Honey or maple syrup to sweeten the tea. The tea is meant to be taken in the evening before bedtime. Indian Rhubarb/ Rhubarb root is a cholesterol-buster. Consume it after a meal that's heavy in fats. Dose of powdered root is 3 to 30 grains. Combine well all powders of 3 parts turmeric, 6 parts cumin, 6 parts coriander, 6 parts fennel, 2 parts fenugreek, 1 part dried ginger, 1 part black pepper and store in a sealed container. When preparing your meal, sauté a teaspoon of spices in a small amount of ghee or olive oil. Combine with vegetables or grains to give them a satisfying flavor and enhance digestion. Add salt to taste. This natural remedy is highly beneficial in dealing with high cholesterol. Make a fine powder of 50 gm Fenugreek seeds, and 50 gm Black Cardamoms and save in a vessel. Take 1 tbs along with water after any meal once a day. This natural remedy will be quite beneficial for controlling high cholesterol. Boil 2 tsp Coriander seeds or Coriander seeds powder In 1 glass of water for 5 minutes. Strain and drink this decoction twice daily. You can add milk, sugar, and cardamom to it to improve its taste. This could be a welcome substitute for tea or coffee. It helps reduce cholesterol, flushes out toxins, and improves digestion. Coriander helps lower the levels of total cholesterol, LDL (the ‘bad’ cholesterol), and triglycerides. Similarly, drinking coriander in water everyday helps in the reduction of cholesterol in the body. This regime must be continued for about a month. Then the cholesterol levels must be checked again. Boil 2-3 cloves of organic garlic and in a cup of milk for a few minutes until the garlic gets cooked well. Now consume both the garlic and the milk twice daily. This will reduce the cholesterol; take care of cardiac pains in the body and providing a good health to the heart. It has to be continued for a few days before the method begins to show its effects. Both raw and cooked garlic help control high blood pressure and at the same time reduce cholesterol levels. Blend well one small onion, 1 cup buttermilk, ¼ teaspoon black pepper powder and rock salt to taste drink. Consume it on a regular basis. Or mix one teaspoon each of onion juice and honey. Drink it once daily. Consuming Red Onions help reduce bad cholesterol and elevate good cholesterol levels. It also helps to cleanse the blood, regulates the heart action. This, in turn, lowers the risk of developing heart disease. Mix well 2 tbs of pure Honey and 3 tsp of Cinnamon Powder in 16 ounces of tea water. Give ¼ cup of this mixture to the patient 3 times a day when it is lukewarm. It is found to reduce the level of cholesterol in the blood by 10 percent within two hours and any chronic cholesterol is cured. Make a paste of Basil leaves and Black pepper corns in equal amounts and take ¼ tsp daily with your two main meals (breakfast and dinner). Basil has the capacity to dissolve the accumulated cholesterol from the arteries into the person's bloodstream. From here they are eliminated by the kidneys. Blend in blender ¼ cup freshly made organic yogurt, ¾ cup purified cold water and 1 pinch each of powdered cumin, rock salt, black pepper and 7-9 Coriander or Mint leaves until a foam forms on top. Drink lassi after lunch it helps restore the healthy microbes to aid digestion and also helps in reducing the levels of cholesterol in the body. Stir well 2tsp of pure honey with warm water and a half spoon of lemon juice and drink every morning on an empty stomach daily. This acts universally as a best blood purifier and also a good drink to keep the cholesterol and your weight under control. Mix one teaspoon of gooseberry powder in a glass of warm water. Drink it daily in the morning on an empty stomach. Emblica gooseberry acts as a natural hypolipidemic agent, which means that it promotes the reduction of lipid concentrations in the serum. Mix one teaspoon of organic apple cider vinegar and one tsp of pure honey in a glass of lukewarm water. Drink this two or three times a day at least for a month. Apple cider vinegar is known to enhance fat metabolism and reduces ‘bad’ cholesterol. It helps lower your total cholesterol and triglyceride levels and pure honey taken with food daily relieves complaints of cholesterol. Soak 1tsp Fenugreek seed in hot boiling water overnight night and strain munch them early in the morning on empty stomach. It will reduce your cholesterol and excess fats. Or boil 2-3 tbs of fenugreek seeds for 2 minutes in water strain and blend them into a fine paste. Eat one tablespoon of this paste early in the morning on empty stomach and in the evening respectively. Continue for two or three months to control and lower your cholesterol level. Fenugreek seeds taken regularly are found to help in stabilizing high cholesterol. Add ½ teaspoon of Turmeric to a glass of hot boiling Milk. Drink this mixture before going to bed. Turmeric significantly decreases inflammation throughout the body, which is a primary cause of high cholesterol and even high blood pressure. By actively reducing inflammation, turmeric helps improve cardiovascular function and maintain healthy blood flow. Turmeric has been shown to lower the levels of LDL cholesterol and therefore, it can help cut down on the build-up of plaque on the walls of the arteries. Evening primrose seeds contain oil with a high concentration of compounds rarely found in plants: essential fatty acids, specifically gamma-linolenic acid. A study shows that 79 people with high cholesterol took 4 grams of Efamol every day for three months (which provides about 320 mg of GLA), and their average cholesterol level fell 31.5 percent. The suggested dose for evening primrose oil starts at 1-gram gel caps twice or three times a day. High cholesterol requires professional care, so consult your physician about GLA.